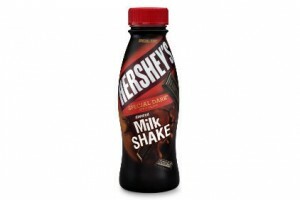 Hershey’s Milk & Milkshakes, a line of single-serve milk and milkshakes, announces the introduction of Hershey’s Special Dark Milkshake to its premium line of single serve refrigerated products. Along with the existing flavors, the Special Dark Dark Chocolate flavor will be available in 12 oz. single-serve, plastic bottles at retailers nationwide beginning in March 2013. 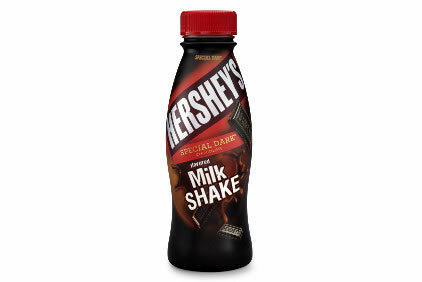 Hershey’s Milk and Milkshakes are made with real sugar and no high fructose corn syrup in a variety of flavors, including Hershey’s Lowfat Chocolate Milk, Hershey’s Creamy Chocolate Milkshake, Hershey’s Cookies n’ Creme Milkshake, Hershey’s Strawberry Milkshake and new for 2013, Hershey’s Special Dark Dark Chocolate Milkshake. HP Hood, one of the nation’s leading dairy processors, partnered with The Hershey Company to launch the line of Hershey-branded products in 2010. 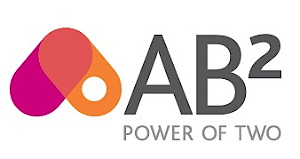 The products have been extremely well received in the marketplace and represent the quality and taste consumers expect from the Hershey’s and HP Hood brands.